In this blog post we will cover three different types of grout installations, so you can select the right option for your home or project. The first type of grout installation option is using a contrasting grout. What you want to consider about using a contrasting grout is that it doesn't always work well with all types of tile and stone materials. It's best to have your contractor test grout colors with your material to make sure you like the final result before you install an entire bathroom or kitchen. White marbles in particular can sometimes be stained by darker grout colors, and certain transparent glass tiles can change color when using a contrasting grout. Make sure to check your material's specific installation guide lines and discuss with your contractor prior to installing. A complimentary grout color is simply using a light grey grout with a light grey tile or stone, or a white grout with a white marble or ceramic. This keeps the overall pattern of the tile or mosaic a bit softer to the eye and more consistent. Using a complimentary grout color might be a good choice for you if you're someone who prefers not to draw attention to grout lines. This can also be a good choice if you have a lot of different patterns or elements being installed in a bathroom or kitchen, and you want everything to flow together for an overall clean and cohesive design. 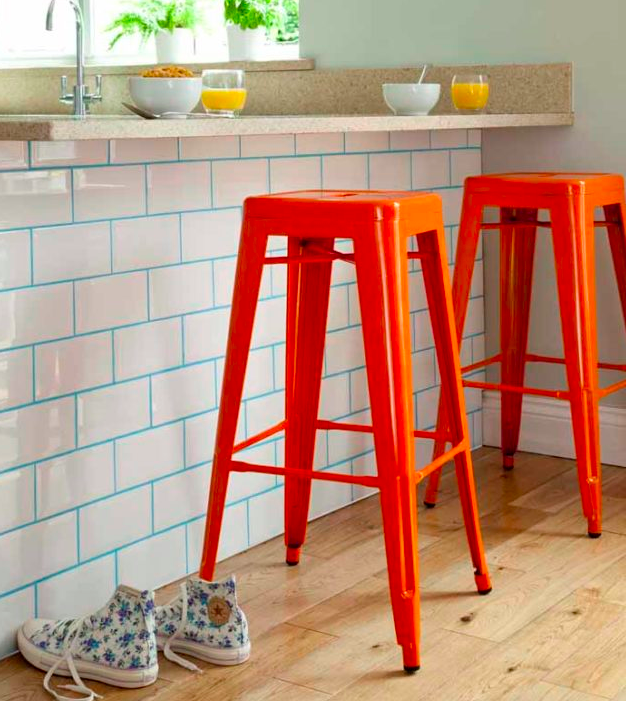 Using colored grout is somewhat of a new design trend that's gaining popularity, especially if you're someone who wants to make a statement on a floor installation, a powder room feature wall or even the face of a bar like the image shown below. Colored grout installation is pretty self explanatory and similar to using a contrasting grout. Just pick your favorite color and get busy installing! Which grout installation option is your favorite? Let us know in the comment section below!